In all flow cytometric analyses, it is highly important to capture biologically significant data relative to the question being asked. As such, analysing cells that are healthy/highly viable is key to good data acquisition. In many cases, freshly isolated cells, cells grown in culture or those treated with harsh reagents can undergo spontaneous cell death releasing their contents into the surrounding media. This material can have an agglutinating effect causing cells and antibodies to aggregate into non-specifically labelled clusters. This can be particularly confounding since not only does this make analysis of viable cells difficult, but the number of single cells for analysis in the suspension is reduced. Moreover, as cells begin to die, they become porous and expand prior to the complete loss of structural integrity and fragmentation into small vesicles or apoptotic bodies. This increased porosity also allows antibodies to cross normally impermeable cell membranes into the cytosol where they can interact with intracellular proteins via off target binding interactions. This can be problematic, especially when acquiring data for assays performed under live conditions, as dying cells may then seem to positively express the antigens of interest, however, the signals obtained may be misleading. When acquiring data, viability can be roughly estimated from a simple plot of forward vs. side scatter. However, dead cell discrimination is not fully realized by this method, where porous cells, in early stages of apoptosis (with potential non-specific labels), can be misidentified as healthy since there is little difference in scattering patterns. It is therefore important to include dead cell discrimination dyes as part of the experimental design to minimize the inclusion of false positives when analysing the data. Figure 1: (A) Scatter profile of cultured HEK293T cells (FSC vs SSC). (B) When the same FSC data is plotted against 7-AAD (y-axis), unhealthy cells are nicely separated from the 7-AAD low/negative with a highly fluorescent 7-AAD population. When comparing the FSC axes on the plots above, the 7-AAD stain reveals many cells in the process of dying that might have been included in the analysis if relying solely on scattering profiles. In this example, if scatter gating alone was used for dead cell discrimination the number of “healthy” cells analyzed would have been overestimated by greater than 10% i.e. : 7.69% in (A) vs 21.22% in (B), therefore, when planning flow cytometry experiments it is highly important to include a dead cell exclusion dye as part of the fluorophore panel. There are many dead cell exclusions markers available across a wide range of excitation and emission wavelengths allowing for a high degree of flexibility in panel design. Traditional DNA intercalating stains such as Propidium Iodide, 7-Aminoactinomycin-D, or DAPI are impermeant to cells with intact membranes and may only be used in experiments with unfixed cells whereas, amine reactive dyes such as the Live/Dead® Fixable series (ThermoFisher) or the Zombie™ dyes (Biolegend) can be used for both fixed and unfixed samples. 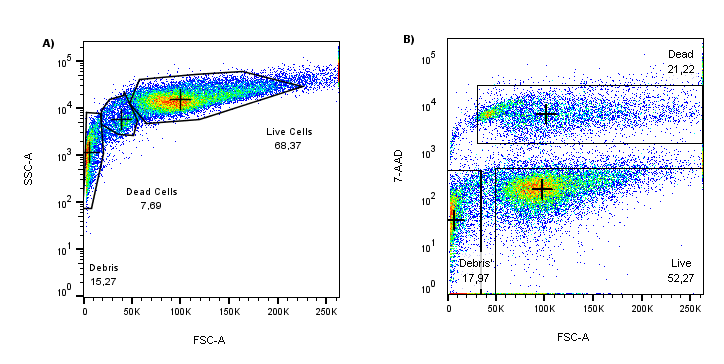 For further details regarding dead cell discrimination probes and their uses in either live or fixed analysis conditions please visit our Viability Stains page here.